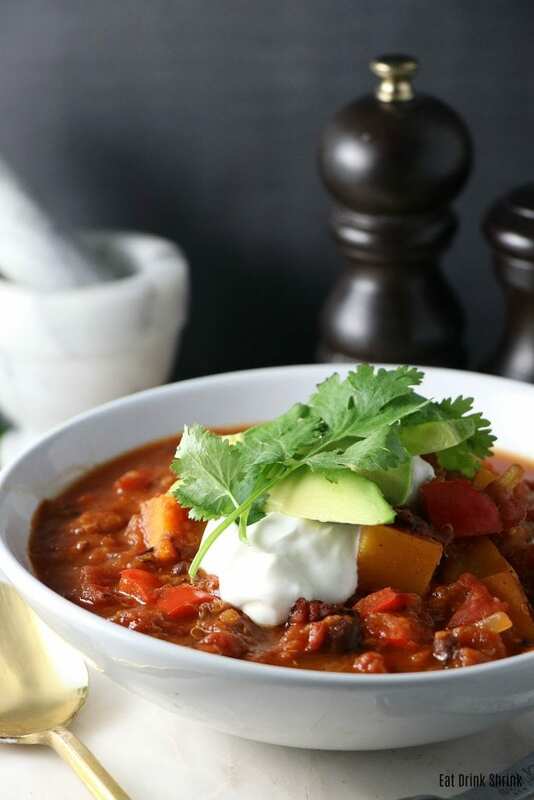 Vegan Butternut Squash & Quinoa Chili - Eat. Drink. Shrink. If there is one thing I love about the fall weather, it’s vegan chili! It’s my favorite go to for many reasons. It can be easily thrown together, is filling, packed with veggies, can last throughout the week, and costs next to nothing to make! That being said, you’ll always find vegan chili in our home when the colder temperatures arrive! 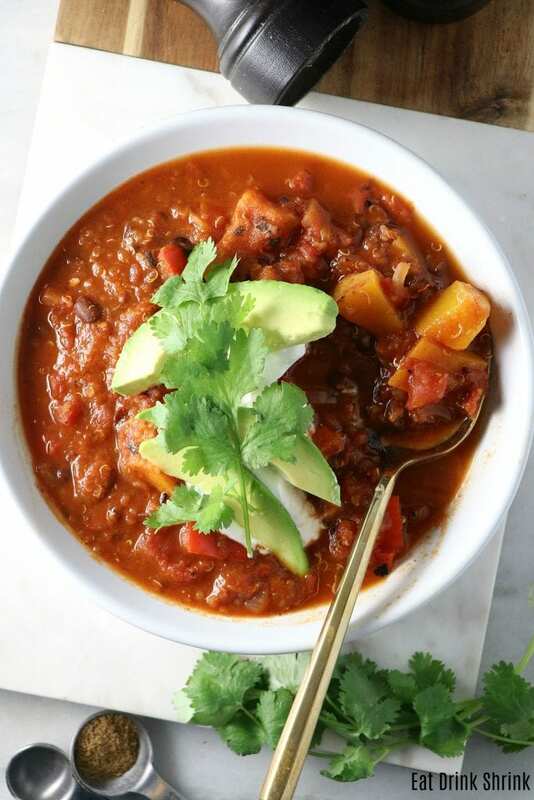 What’s great about a vegan chili is you can pair it with whatever you like, leave it in a crock pot to enable the flavors to combine and go on wth your day! For those that have a hectic schedule or are simply not crazy about cooking altogether, this can be the answer to your foodie prayers lol. 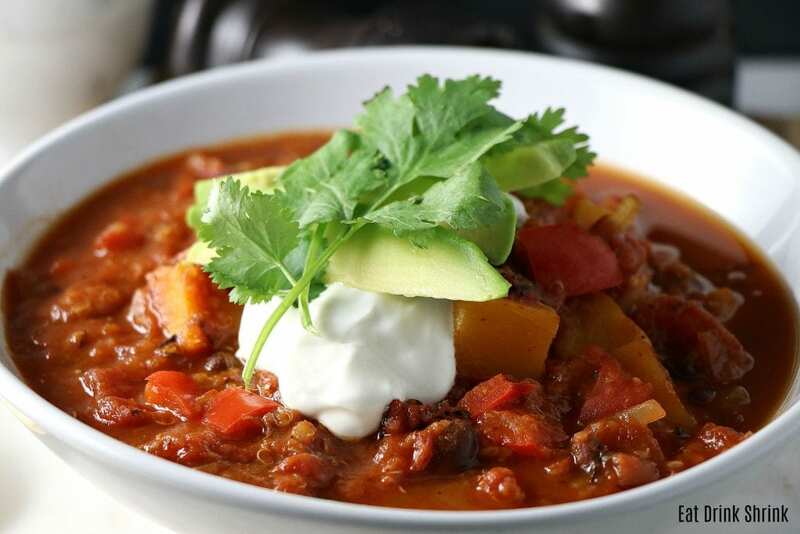 What’s fab about this particular chili is it’s packed with protein from black beans, healthy grains like quinoa, bell peppers, a smokiness and heat from the adobo peppers, multiple types of tomatoes, seasonal butternut squash, and doesn’t even need meat to make it complete! If you’re searching for that classic fall chili that doesn’t disappoint, you have to try this recipe for vegan Butternut Squash & Quinoa Chili! Vegan sour cream, avocado, and cilantro optional! In a crock pot over medium heat add onion and bell pepper. (I put mine in later, but prefer this way!) Cook for 6-8 minutes until translucent. Add the garlic, tomatoes paste, chili powder, cumin, and salt. Stir in water, black beans, bell peppers if you haven't yet, cooked or uncooked quinoa, diced tomatoes, adobo peppers,tomato sauce, crushed tomato and butternut squash. Simmer, covered. Squash should become tender in 25mins. Stir in vinegar. For optimal flavor allow the flavors to combine for a few hours or all day on low heat. If desired top with tofu sour cream, vegan cheese, avocado and cilantro! You can buy cooked quinoa at the store to minimize time or if in a time crunch throw it into the pot. I don't recommend Rotel Crushed Tomatoes due to the can not being BPA free. Gabrielle, what's the quantity of the adobe peppers? I don't see them in the recipe list. Also, do you just leave it simmering in a crockpot for 20-25 minutes? I guess I'm wondering why use a crockpot vs a big pot if we're not letting it cook for a few hours. Thank you! Hi Tracy! The amount of adobo peppers should be visible now. You can let the chili simmer all day for optimal flavor! Seems like you need a pot on the stove....doesn't sound like a crockpot would work so well according to your instructions??? Hi Joan! You can cook the onions, garlic, and bell pepper until soft with no problem in the crock pot or if you prefer you can simply throw everything all in together to minimize time. Don't see quinoa on the list. How much and when do you put it in? Hey Polly! The recipe plugin was giving me issues for some reason! I used 1 cup cooked quinoa, but you can always use more! This looks good but.... Everyone should know by now that canned tomato products are very unhealthy as the cans are lined with a known carcinogen called BPA. You can find them in non BPA lined cans at whole foods. Also, you should use tomato products that are unsalted, as the sodium content is extremely high in these products. Yes! You can use any BPA free tomato sauce or crushed tomatoes that you prefer. There are many organic options with low sodium. The bigger issues with store bought tomato/pasta sauces is sugar content, not sodium. Always read your nutrition labels! I am trying to find nutritional values. Carbs, and such. t2 diabetic and have to be careful. What does it mean, "both types of beans? "I see only one can of black beans on the ingredients list? I removed red beans from this concept! Please disregard "both types of beans", Sorry about that! This is amazing! Pot is simmering now for lu Che's all week. Thank you for sharing!! Amazing! Let me know how it turns out!